SRB is recognized as one of the world leaders in Split Bearing technology with vast experience and expertise in the area of split bearings. SRB Split Bearings have been designed and developed to maximize service life and minimize maintenance effort. Statewide Bearings are a full service provider offering a complete range of services from bearing selection, through installation and training to maintenance, repair and other technical support. FAG (Schaeffler) manufacture a range of split spherical rollers that replace standard spherical roller bearings that will replace the bearing and adapter. 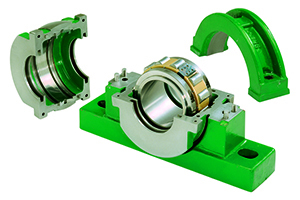 Split bearings are used at locations of restricted access and as replacement bearings. Split designs are available for cylindrical and spherical roller bearings with outer diameters up to 1750mm. Areas of application are converters, continuous casting machines, drive shafts and cold pilger machines.